In a world where the term “fake news” has gained more and more “value” it is vitally important to pause so we may reflect on how much power it is given. News is received through so many different outlets at times it becomes difficult to cipher truth from fiction; that is why we rely so heavily on professional journalism and those who truly put forth the work. Their work is based on bringing an un-biased, truthful account of events taking place throughout the globe. We give them our trust to provide us with that information and more importantly they offer a voice to those who have none. 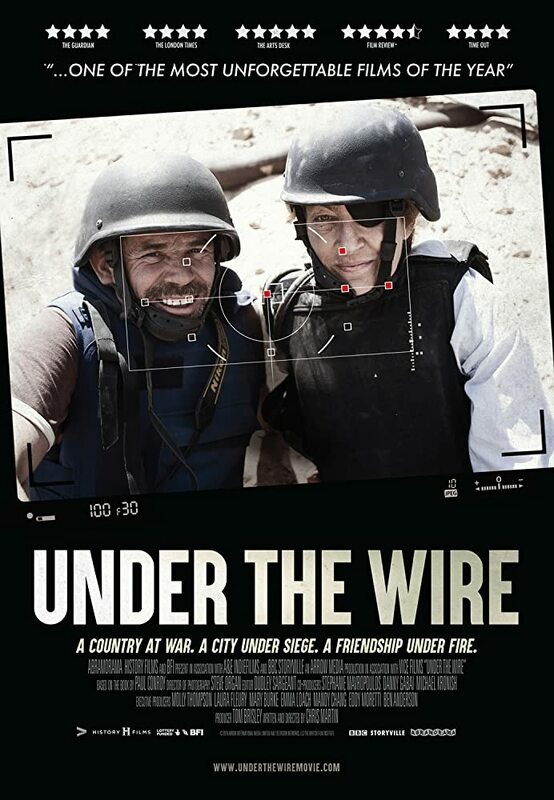 In one of the most raw, honest accounts of war journalism the documentary Under the Wire from director Chris Martin covers the story of two journalists, Marie Colvin and Paul Conroy, as they try to tell the story of civilians being slaughtered by its own government in Syria circa 2012. Marie is world renowned as a journalist who would go to any lengths to cover a story; including losing an eye when struck from shrapnel during a bombing. She risked her life every time to bring a voice to the voiceless. She teamed with photographer Paul Conroy to cover the 2012 revolution in Syria taking place in the city of Homs. Homs was the center of the revolution and also the main target of the government’s bombs led by its president Bashar al-Assad. News sources within Syria reported that the government’s strikes were all made on terrorist sites, a blatant lie that its president tried to cover up. Marie felt a responsibility and that is evident based on all accounts from colleagues throughout the film and the coverage that followed after her untimely death. The film covers the time both stayed, less than three weeks, in a home considered the “media hub” of the revolution where local journalists were trying to spread the message of their slaughtered people. Regardless of how many films we watch and think we are accustomed to violent or gory scenes nothing can compare to reality. Watching a baby slowly die is an unbearable image no one should bear but at the same it is so important that so many do see it. It brings to the forefront an issue no one knows is occurring and spreads the message of these poor citizens. From the start of the film I felt an unease, albeit not the same as Marie or Paul but the feeling of them crossing the border without being found was an adrenaline rush. Witnessing their time spent day by day in this unbearable environment, none of us will come close to understanding the fear of losing your life in any given second. There is no holding back and in watching this film you go through the same hell all these people did. As Paul states at the end of the film even after six years he still tells their stories. It is his responsibility to those who lost their lives and fought for him to make it back home to continue sharing their accounts. His life changed during those events as many others did and for no other reason than to tell the truth and bring it to the masses, there is certainly nothing fake about that.